A metal roller is a metal forming machine that uses a series of rollers to shape or impart physical qualities onto a metal. When a sheet of metal is passed between two rollers, strain hardening, or the plastic deformation of the material, causes the material to become flattened somewhat. This flattening without heat gives the steel higher levels of strength. 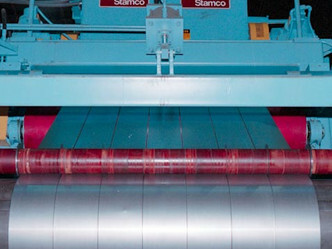 Cold Rolled Steel – Block Steel Corp.
Because no heat is involved in the cold rolling process, the oxidation risk that is always present when heat treating steel is eliminated. Cold rolled steel has a smooth surface texture and is commonly used in objects that require the integration of strong steel shapes. The process is done at or around room temperature; the steel is usually covered in oil and then shaped. 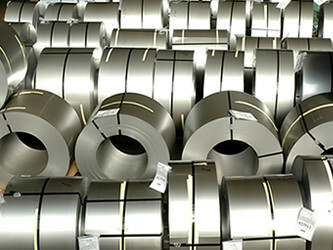 Applications for cold rolled steel include automobile parts, construction materials, appliance parts, furniture parts, computer-cabinet hardware, small appliance parts, and other industrial purposes. Important factors to consider when selecting cold rolled steel are coil condition, thickness and width limits, coil diameter, coil weight, and surface quality. There are many methods of forming cold rolled steel, including bending, hemming, drawing, stretching, flanging, and draw or stretch forming. Cold rolled steel products are manufactured in three different quality types. The first is commercial quality, which is mostly used for hollow metal work. Commercial quality cold rolled steel is often used in light duty construction applications; door frames, stairwell components and other comparatively small steel construction components are often made of commercial quality cold rolled steel. Drawing quality, the second type of cold rolled steel, has a greater degree of ductility. Drawing quality cold rolled steel is created by metal drawing, which is a process that uses forces of tension to draw metal, which increases its ductility. The third quality, physical quality, is commercial steel that is further processed. Although cold rolled steel doesn’t have the shape range that hot rolled steel does, cold rolled steel offers good qualities of tensile strength and a smoother finish. Elimination of oxidation risks is one of the most important advantages of the cold rolling process. Cold Rolled Steel Cold rolled steel is steel that has been shaped by rolling equipment without the application of heat.